It’s May. It’s the end of the school year. And for many, it’s a time that pushes educators into survival mode. It is May after all, so this seems appropriate. A while back, I got to thinking about how much deliberate effort is spent on getting the first days of school just right. The tone we set during that first week does more for campus culture and climate than maybe any other week. It’s absolutely right for us to be deliberate and particular about how we begin the year, but for all the fuss about how we start things off, I rarely hear much about ending the year well. We cannot afford to do anything other than continue to pursue our students. Our students and colleagues are worth more than our survival mode efforts. We can make just as great an impact in our last days with students as we did in our first hours together. 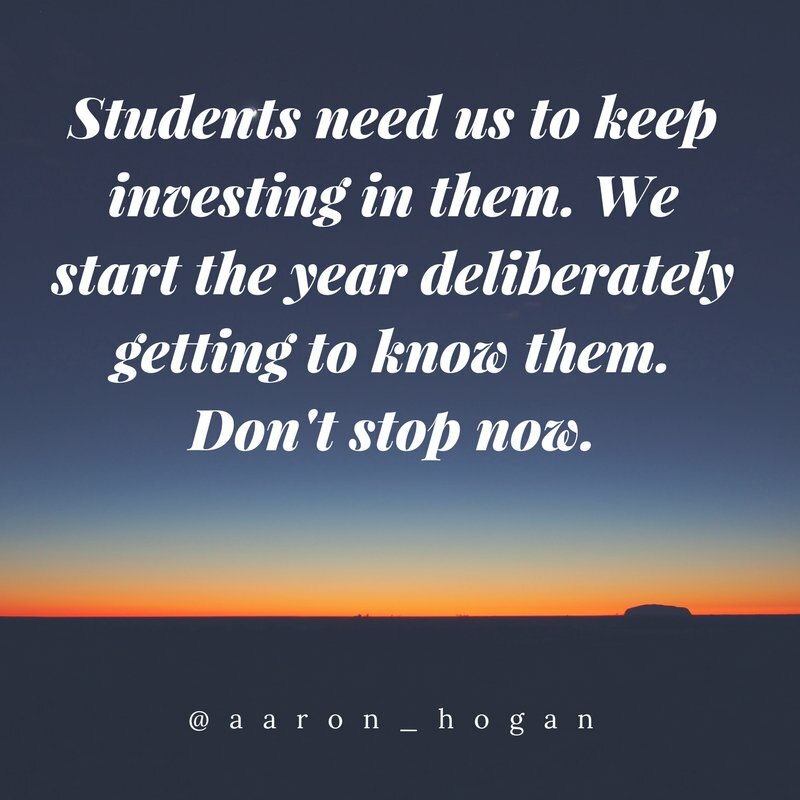 Never stop getting to know your students (even at the end of the year). Invest in them. Let them know that they are loved. Much like a successful start to the year, a successful end to the year is an active pursuit. I reached out to educators on Twitter and asked them what they do to make the end of the year great. Here’s what they had to say (in their exact words, rough draft form of course). Take some time to dig through their ideas. There’s something amazing for you in there. And share your ideas afterward. We’ll all benefit from you sharing your ideas for finishing the school year well! Focus on the student, teach and model growth mindset, keep pushing them to make better choices, remember to be more student led than teacher driven. I try to give them the most control they’ve had all year. Currently, some are doing TED talks, other classes will be designing lessons to teach for the full class period (groups). It is time for students to share back their learning, and teach each other. By teaching lessons, students gain insight into instruction, put content into their own terms, and as a bonus: they learn how tough it is to be a teacher! I end the year by doing several STEM activities. The kids design, create, build, redesign, and compete with different things. We make memory necklaces. Each student creates a signature bead from sculpy clay. They make sure to create a bead in this style for each member of our classroom community. We then have a sharing circle where each first grader receives a bead from each class member( teachers and IAs too) . Everyone has a keepsake to wear which reminds them of their special year together. Review Olympics– two weeks of competition and games with individual and team events. Every year I add new games. The goal is both review and to let the kids know how much they’ve learned this year. We do a economics unit and create a popcorn business. We go out to a local business called The Popcorner to see how they run the popcorn business. We also go to the bank and learn about taking out a loan. We pretend sign our start up loan. We vote on where the profits should go. We have donated to Jump Rope for Heart, tornado victims, local library. Each year it is something different. My students present their Genius Hour projects. They teach all of us. Its a great way to end the year. Since my subject is not tested until May, we really don’t have a lot of time to complete all the fun things on my list. In saying that, the last couple of years my teammates had a great idea – to complete STEM activities after our STAAR test. This year we are putting a spin on it… we will have a competition! For instance: Teacher A will hold a competition with STEM activity 1 in her classroom, Teacher B will hold a competition with STEM activity 2 in her classroom, Teacher C will hold a STEM activity 3 in her classroom, and Teacher D will hold a STEM activity 4 in her classroom. Learners will be able to choose which activity they want to complete with a team. They loved it when it was just in our classroom, so I anticipate this being even more fun for them! During the last few days, I will also have my students complete a survey so I can gather feedback on my teaching, lessons, and content. I will send a similar survey to my student’s parents as well for their feedback on my communication, use of social media, their likes, and dislikes about our class, etc. to help me be improve. Also, I recently found an awesome article (http://www.teachhub.com/top-12-effective-end-year-activities). It has some fantastic ideas for the end of the year! My favorite is “let the kids teach class” and “ask students to write letters to your future students.” Both of these are very meaningful. I NEED to fit at least one of these in! When I taught 7th grade science (non-tested), I put together an after-school group and they created a video for my incoming 7th graders. It was amazing and they loved the experience. Also with this grade level and at the end of the year, I had my students attend “medical school” while we covered every human body system, which just so happens to be my favorite content area. Spend time on student generated PBL projects, allow students to prepare presentations and information for incoming class the next year, and we have a 5th grade take over day where they run the school. I typically have my students complete a power point presentation reflecting back over the year (favorite lessons learned, highlights, pieces of advice, etc.). I enjoy completing a book study with my students as well. In the past we have looked at Sean Covey’s book 7 habits of highly effective teens. Since my students aren’t quite teens we read together and discuss the 7 habits. Then they take their copy of the book with them. We research a Famous American throughout the last two weeks of school. As the year gets crazy with end of the year assessments and scheduled chaos, the kids have a focus. We have a wax museum one of the last 3 days of school to showcase our learning. We look at their overall growth, goals, tests scores, reading level, math level… we start talking about goals for ieps next year as well….. this builds confidence… we then review this at the beginning of the year to remind them of the possibilities. I used to do camp for a week. It was like a day camp in the classroom. We’d still learn, but in short lessons along a theme. I did Camp Ohana, with Elvis music and Hawaiian activities, I did Camp lickity split with tons of popsicle stick activities. Camp names! Lots of good memories all around! Checking in, a count down of things we “get to do” before summer arrives (eat lunch with friends, spend time with our fav staff, make memories, etc…), we also have an end of the year fishing/picnic day for all of our students that receive sped services; we let them know that learning is hard sometimes and they came to school daily and challenged themselves, overcame obstacles and worked hard. Students, sped teachers, and paras all come along, we play bags, fish, BBQ and have a kick ball tourney…playing together to celebrate the year! Play at recess! make sure my postcards are all sent! celebrate academic and personal successes! 1. In mid-Feb., we partnered w/ another elem school in another state and embarked on a “Work Hard/Play Hard” Challenge. The challenge was for students to accomplish 10,500 pieces of proficient/distinguished work. For every 300 pieces they collected, they earned a puzzle piece that revealed part of the “play hard” activity. The puzzle pieces are displayed on a large bulletin board at the entrance. Once the puzzle is complete the entire school will enjoy the activity! 2. We just had a community kickball game called “The Green Patch” game b/c it’s played on the corner of Green/Dickinson St. Families love it! 3. We purposely focus on relationship building and out of the box thinking just like we did at the beginning of the year. 4. We stick to the fundamentals – relationship building, expectations, and working hard and playing hard. We do a house challenge to motivate and keep our 8th grade invested the last 6 weeks. They have a blast as we split them into 4 “houses,” do a weekly challenge, keep points for academic and behavioral success, and do house team prizes! Continue the high fives, fist bumping and name recognition. Also, push to find the sleeper, quiet kiddo that may need some help coming out of his shell. Can’t forget the teacher support and recognition! Continue building on existing relationships by having intentional conversations. I focus a lot on what they’re going to do with family, how they’re going to re-energize for the next school year, and let them know that I can’t wait to see them next school year (or wish them well for their future if they’re moving on). I want them to know that I value them and their education but also (and just as important) that I value the time that they will have away from the formal educational setting. Family time, and time to re-energize away from school is so important. Giving students an opportunity to demonstrate and solidify their leaning by giving them more choice over what they are learn and how. Self directed projects that can be shared with their classmates. I would say, creating stronger and more positive relationships with parents and students. They need to know that they’re important for us even at EOY. Relationships! Our 5th graders have a school dance the last week to build last memories as well as a celebration that mirrors a graduation of sorts. Also, on the final day we do “bump up day” where each grade gets to go see the teachers and grade level they will be in next year. During this time the students currently in the grade have left cards or messages of some sort for the next group of students coming in. KN students do a end of year song celebration inviting parents to come and celebrate the end of the year. As a school we have celebrations that recognize the hard work and achievements of students. This ranges from awards ceremonies where students are recognized by grade level and content areas to our field day activities. We have field day activities for each grade level where we all go off campus and spend a day having fun and being with school friends. In my district, middle school is a quick two years because we only have grades 7 and 8. This makes our school more of transition time for students than anything and because of this we have to help orient students quickly. We do this though school videos and school tours for the incoming 7th grade students. In the middle of May all 6th grade students from our feeder intermediate campus will tour our school during the school day. These incoming students will also watch videos made to show the school in more detail as well as with tips and tricks from current middle school students. The current 6th grade students like this because they are able to see what is going to occur in middle school before summer begins and the current middle school students like this because they are able to be he experts and share their knowledge about their school. As the principal I encourage my teachers to end the year on a high note by trying new and different teaching styles and approaches. State assessments have ended and the month of May is a great way to try a flipped unit, a PBL unit, incorporate genius hour activities, or even practice using learning stations. I find the teachers are more willing to try new things in May because they are not worried about a state assessment. What I have observed is the teachers see their students having fun with the different approaches to teaching and learning because it is not the same routine they have come to know. As a result of this willingness to “experiment” with their teaching, the teacher is more likely to make adjustment to their teaching the following year. This helps end the year on a high note for the students and the teachers. Our seniors end the year with a service day. They volunteer at various places around the community. This has proven valuable for the students and local organizations. We have received multiple letters from community organizations thanking the seniors and asking that more seniors return the next year. This experience leaves the students with a good feeling as they graduate and move on to the next phase of their lives. There are SO many great ideas here. Reach out to the authors of these ideas. Collaborate with them. Follow them over the last month of the year on Twitter and see what all they are doing to make the last days of the school year GREAT for students! Have a wonderful final month with your students! This is great! Check out our tips for teaching students the skills they will need in the future, http://bit.ly/2pdwJDX.